I’ve been podcasting since November 2005. That makes me an old-timer when it comes to this hobby of mine. Over the last 11 years, there have been a lot of innovations in the podcasting industry but one thing hasn’t changed. You still need the help of your listeners. 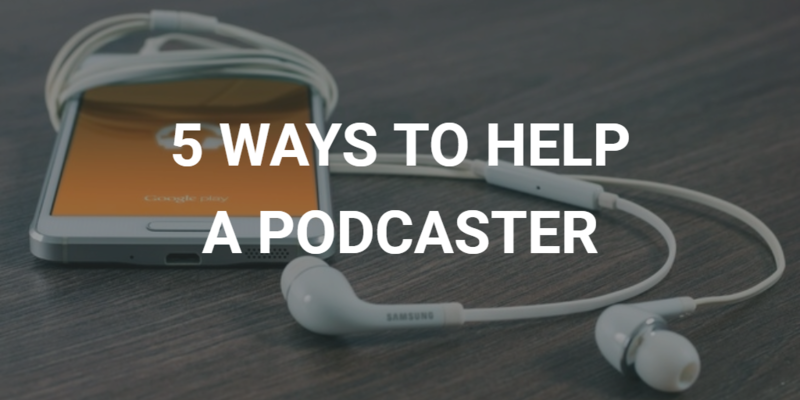 If you’re a listener of podcasts you’ve probably wondered how to best help and support your favorite podcasters. Sure, donations and advertisements are great ways to help us out but there are 5 Ways to Help Your Favorite Podcaster that only take a little bit of your time and won’t cost you a dime. This seems like a no-brainer but it’s really important. I’ve seen a lot of people share my podcast’s show notes and not listen. There is usually so much more in the podcast than what you’ll find in the show notes. Sure, show notes can be great to share but take the time to actually listen to the podcast. Remember when you were a kid and you went to see a movie and all you could do was talk about it and quote lines from it for 6 months? Podcasters like it when you do that with their podcasts too. After listening, talk about what you heard with other people. They’ll want to know where you got that information or interesting quote and you can move on to the next way to help a podcaster. This ties in to talking about someone’s podcast. Sharing your favorite podcasts over social media or in person helps spread the word about them. Many podcasters cannot afford advertising. They rely 100% on word-of-mouth or social media to get the word out about their podcast. Share your favorite podcast today! Podcasters are constantly sharing their podcasts on Facebook, Twitter, Pinterest, Instagram, and other social media outlets. Because so many people are following podcasts through these social media sites they don’t feel the need to subscribe to a podcast. Podcast subscriptions provide social proof and help increase a podcast’s visibility. No matter where you listen to a podcast, please take the time to review it. iTunes, Stitcher, and other podcast syndication services provide ways for you to review a podcast. Your review might help someone else decide to listen and subscribe. Get out there and review a podcast today!